After our walking pilgrimage in India, Guri and I spent a few days in Mount Abu. Almost out of nowhere, we remembered that a famous Indian saint lived in town, and so we asked about her whereabouts. "Oh, Vimala Thakar? Yeah, she lives in a bungalow in town, but she's quite old now, only sees a few people and that too, with appointments. You won't get to see her." We still went. And we walked. Asking directions from one person to another, we reached the unassuming bungalow with a cream-and-red sign. No labels, no fan-fare, no one at the gate. We opened the gate ourselves, almost feeling like trespassers. As we meandered through the serene property, a woman in a white saree walks down a flight of stairs and kindly greets us. She tells us what we expected -- "Vimala-Tai doesn't see anyone on Sunday, unfortunately. Even otherwise, it's recommended that you make an appointment few months ahead of time. But you're welcome to read some of the literature in that room, for a little bit." We gladly took that opportunity. After some hesitation, perhaps feeling bad for us, she adds, "If you give me some identification, though, I will definitely let her know that you came." So we did, as we headed into a room with a couple cupboards full of her books. I remember reading an article in WIE that called her the most awakened woman alive! It was a very powerful interview with her. On our pilgrimage, we also ran into a booklet of hers -- which is perhaps the most lucid, non-religious, and profound description of meditation I've ever read. 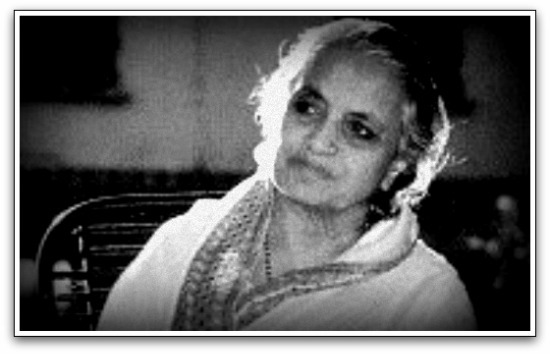 And ultimately, she was a living reconciliation of Gandhi's activism with J. Krishnamurti's spirituality. We had never met her, but we were still fans. Almost as quickly as that woman went up the stairs, she came down. "Vimala-Tai says she'll see you now," she says, almost not believing her own words. We were silently elated, and followed her upstairs. Vimala Tai was seated on her chair. Her grace, poise and strength needed no introduction, as Guri and I sat on the ground. To all of our questions, she responded with a penetrating clarity. What is the purpose of life? "To live." Is service internal or external? "It's all the same. I'm talking to you right now -- is that external? If I'm sharing with something, is that not an internal expression of love and compassion?" Is englightenment a process or spontaneous occurence? "Both." Where will spirituality blossom most, in the West or East? "Everywhere. Even in the Middle-East." Are we on the cusp of a collective transformation? "Yes. Not in my lifetime, but during yours." Does everyone need a spiritual teacher? "No." Is Gandhi relevant today? "Now more than ever." What is non-violence? "Science and spirituality." What is your message for the youth? "Arise, awake and act." To write such Q&A almost trivializes it. When she spoke, there was a unique edge to it. It's hard to describe the power of that raw authenticity. And she had big eyes. Sometimes it felt like her eyes responded before her words were even formulated. Despite her no-nonsense personna, though, she always felt welcoming. At length, she shared wonderful anecdotes from her life -- like when she was five and went out to the woods with a deep desire to find God. "What did you find?" "Nothing," she smiles, "But then one of my Dad's friends said, 'Come, I'll show you God.'" Not once, though, did she step into any mysterious or esoteric conversation. "I have no experience with such things," she'd say flatly. In everything she articulated, she was very clear. Often, she would run out of breath but would continue her responses without skipping a beat. We spoke a lot about Gandhi, Vinoba and J. Krishnamurti. Many years ago, Vimala-Tai had arranged a meeting of Vinoba and Krishnamurti; Vinoba later remarked, "We are like two eyes, pointing to the same thing. One for the atheists and rationalists and other for the thiests who can't find God amongst them." Vimala Tai is perhaps among the one or two people on the planet who could claim deep respect from both Vinoba and Krishnamurti. Everything about Vimala-Tai felt unscripted. Her bungalow itself was received as a spontaneous gift from a friend; all her books were transcriptions of spontaneous talks; her words, her actions, her next moment ... all felt very spontaneous. At the time when we met her, she had banned all recordings, media interviews, and photographs for more than a decade. The cupboards of books in the downstairs room were gifted by people; they don't sell or even ship the books, and instead trust that whoever has a use for them will show up there. To say that she lived a gift-economy lifestyle would be an understatement. Practically everything she said was quotable. Things like, "Every human relationship is a door for liberation. Don't hurt others, and if others hurt you, forgive. Strength of your forgiveness is your true character." In her presence, we felt like a stream flowing through a mountain. And she was sitting like that mountain, without an agenda -- not even an agenda to leave our conversation. In fact, it was us who ended the conversation after seeing her fragile physical condition. She didn't let anyone touch her feet, so we did a half bow of gratitude before we left. As we were preparing to leave, I couldn't help but ask: "You don't see anyone on Sundays. And we even came without an appointment. What prompted you to grant us this wonderful dialogue?" In a matter of fact tone, she replies, "Oh, today is Mokshda Ekadashi, a special anniversary of Geeta Jayanti. Today, thousands of years ago, Geeta was first spoken by Krishna. I am fasting today. Anyone who comes to my doorstep today is an offering from the Divine that I can't refuse." Wow. Talk about being in the right place at the right time! As we left, Guri -- who is not privy to being infatuated with spiritual leaders -- remarked, "The most powerful woman I've ever met." I couldn't agree more. For several hours after our meeting, both Guri and I felt unmistakenly elevated and grateful. Last week, on March 11 2009, Vimala-Tai passed away. I'm thankful that she lived in our times. Yes..it is a Big WOW!! Glad you both were able to meet her. Deeply moving...paradoxically I can't move. The presence invoked makes me so still. As I told you I spent some time with her many years ago. Thank you. "Arise, awake, and act." This account was a chiropractic alignment for my spirit today, Nipun. A subtle shift (which is really all that's ever needed). Thank you! To unscripted lives everywhere! Gratitude to you Nipun for bringing Vimala tai to our life by sharing this with us. Good , you are the lucky chap, to get her blessing and got time on day of Mokshda Ekadsai to interact with such high rised soul..
Nipun, While I was reading this article, I felt a natural call within me to meet Vimala-tai, but sadly, she has passed away for eternal peace. Still, she has left behind a powerful tool -- observe the emotion within us without reacting, and surely a true judgment will emerge. You are a good soul and will always source the enlightened. You surely are keeping Vimala Tai alive. Your dedication to spreading spirituality is nearing the cusp you were enquiring about. You and Guri are blessed. Thank you so much for this article. It really made my day. With your permission, I'll forward it to my friends. We're a big fans of Krishnamurti in our program here. Just reading that interview put me in a different place. Thank you for that. In 1960 Thakar was invited by a friend to attend a series of talks a visiting spiritual teacher was giving in Varanasi. The teacher was the legendary J. Krishnamurti, and he immediately took note of the unusual young woman listening so attentively at the back of the hall and offered to meet with her. Their talks and private interviews sparked an upheaval within Thakar's consciousness, catapulting her into profound silence. "Something within has been let loose. It can't stand any frontiers," she wrote. "The invasion of a new awareness, irresistible and uncontrollable . . . has swept away everything." Within less than a year, Krishnamurti not only confirmed her spiritual realization but urgently implored her to begin to teach: "Why don't you explode? Why don't you put bombs under all these old people who follow the wrong line? Why don't you go around India? Is anyone doing this? If there were half a dozen, I would not say a word to you. There is not time. . . . Go—shout from the housetops, 'You are on the wrong track! This is not the way to peace!' . . . Go out and set them on fire! There is none who is doing this. Not even one. . . . What are you waiting for?" i am so sad to hear about vimala's demise. i was planning to visit her for last three years, but somehow it got postponed. through this blog, i got the news and mourned her loss deeply..glad that you got to have her darshan. i don't think there is another female saint like her in the world. "Intellectually people may aspire to emancipation or enlightenment, but emotionally they love small bondages around them. They go on weaving the network of bondages. They want to belong somewhere emotionally—to the family, to their religion. In the name of security, they create these emotional loyalties and a sense of exclusive belonging, while intellectually, they aspire to absolute freedom, enlightenment. How can the two go together? India is a muslim country right? I just feel the stress you went through. It is not easy to do such walk, or either work with people like this in own vision. I had satsang (meeting) with Vimalaji 3 years ago at her home in Mount Abu. I recall the cold unseasonable rainy season in September, and she welcomed me, even though she was not well from the damp weather. Vimalaji was Pure presence, responding with Totality to all my questions, however simple those questions were. With her image firmly in my mind, my actions and words come from a deeper place. I am grateful for such a rare teacher to come into my life. Her physicality is gone, but she is guiding me (and us). Thank you for sharing your time with Vimalatai. You are both priviledged people to have enjoyed her charismatic presence on such a sacred day and we share a bit of it of it through you. Dear many thanks for sharing. Heartiest Thanks for sharing the teaching of Sri Vimalaji Thakar. Both of you are not fortunate but faithful to the cosmic rhythm. You are very true in your expression. The self could stay many time with Her and also at the last breath. Thanks to Divinity and entire humanity for such precious living moment. May we all live her teaching in day to day life. Be happy ! haartest thanks 2 share vimala maa..
Ah, Nipun! I just Googled "Vimala Thakar" (her name came up in a book I was reading by Jack Kornfield), and what comes up, by Charityfocus?? I loved reading about you and Guri's meeting with her. Thanks. I walked through that gate at Mt Abu. Thanks for sharing your visit. It was like being there. Awwww you were her gift from the divine :) very moving, thank you. Nipun and Guri, thank you for sharing this blessing with us. I would say that you weren't just in the right place at the right time, but you were also the right people. I love the simplicity and clarity of her answers. "Don't hurt others, and if others hurt you, forgive." Powerful! Love this quote: Strength of your forgiveness is your true character. Thanks for introducing Vimla Tai. I feel like she is talking directly to me. Can you tell me what is the best source to access her writings. Wow, so much gratitude for this share, N & G! Thank you for following your intuition, asking the probing questions, sharing her insightful responses, and being at the right place at the right time! I had never heard of her before today when my husband randomly sent this piece to me. So much wisdom, and I'm so touched by her mountain-like quality that you described, and her life of spontaneity and presence. Could read it only today. What an experience! Feel blessed to read about such a great saint. And U consider myself blessed to staet my fay reading about Vimala Tai. And i consider myself blessed to start the day reading about Vimala Tai. Thank you so much. I fold my hands, bow head in gratitude; my eyes are moist. The fragrance of Vimlaji's persona will live in my heart.